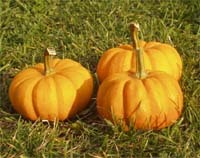 In our farm open daily in autumn with pumpkins available through the first freeze; call English-speaking Jan Brotanek for details or to arrange a special group visit. By car: Drive to Koněpruské jeskyně (caves) near Beroun, then follow sings to the village of Bakoš (about 5 km from the caves). Once in Bakoš, turn left at the pumpkin patch sign, then turn right after about a half-block into number 8, which is the farm. A visit to Bykoš farm, 35 km outside Prague, is a fun way to spend a fall afternoon. You can pick your own pumpkins in a nearly field, buy smaller pumpkins and gourds at the farm, and choose bouquests of pretty dried flowers and other treats, too. Childern can also visit the farm's rabbits, chickens and turkeys.